QUESTION: What is a cycle inversion? This reaction period of 2 to 3 years how do you know it will extend or not? ANSWER: Cycles are turning points in time. You cannot always ascertain what the event will be a high or a low near-term. However, it is a turning point producing an event. Normally, you can predict it will be a high or low based upon the price action going into the event. Looking ahead even decades is sometimes easier. Reactions have nothing to do with the magnitude of the change in trend. You peaked in September 1929 and bottomed July 1932 fulfilling the 34.4 (4 * 8.6) month cycle, which also produced a 3 year reaction. Look at gold for example. Where in 1980 it appeared that at the very least there would be a bear market for 5 years, the probability of a 19 year decline was quite high given how everything was set up in the broad spectrum of markets. Still, notice that the bulk of the drop was 1980-1982, which was the 2-year reaction, but the 3rd year was a high 1983. That was the kiss of death warning that an inability to rally beyond 1984 pointed to a 5 year bear market which it did on point for 1985. Gold then rallied with the decline in the dollar, but it was not making new highs in yen or dmarks. That signaled lower lows ahead and everything pointed to 1999. Everything is linked and performs on a long-term basis much more orderly than the short-term. The most important date in gold is actually 1968 not 1971 when Nixon closed the gold window. Why? Because that is when gold began to trade in London. It was the start of the free markets and the first crack in Bretton Woods. Add 31.4 years to 1968 and we arrive at 1999 right on target. 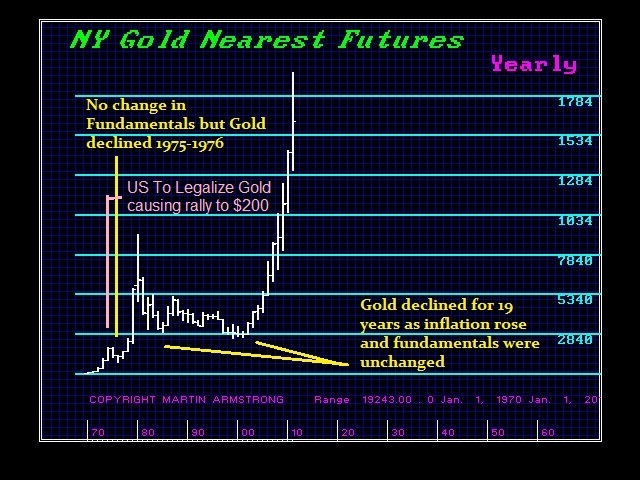 Add the long-term gold cycle of 64 years to 1968 and we arrive at 2032, the end of this Private Wave. Since 1999 produced the low, 2032 should produce the high. Add 31.4 years to 1934 and the confiscation of gold and we arrive at 1965 – the first year of coinage in the USA after the withdrawal of silver. Add 64 to 1934 and we arrive at 1998/1999. Add 64 to Nixon’s closing of the gold window and we arrive at the Pi Target after 2032 3.14 years later – 2035. There is far more hidden order in everything around us than most people are willing to explore. A major Australian company lost a lot of money because its CFO had hedged the A$ based upon the fundamentals expecting it to decline as the trade deficit widened. The board ordered him to meet with me. You can imagine his goal was to try desperately to prove me wrong. Anything I said he replied that could be coincidence. It was frustrating. So I asked him what was his background. He became embarrassed. He replied nuclear physics assuming I would then attack him for lacking a business/finance degree. I said great! Let’s look at the markets from the perspective of the laws of thermodynamics. His eyes sparked. His mouth dropped. He looked at me and said – OMG, there has to be a cycle! I said that’s right. Cycles and understanding this was how all energy moves is the key to grasping the conception of the world around us in every aspect. Perpetual motion in any system is not possible – hence Marxism and Keynesianism must fail for you cannot remove the cycle from the economy. You cannot create perpetual economic growth without recessions any more than either the Democrats or Republicans can perpetually control Congress.